--Also available with different color of cotton back and cuff. --PE cuff is also available. Description Water-Proof Cow Grain Full Palm Glove;Fully Thinsulate Lined; Nylon Cloth Back; , Size 11"
Farming; Material Handing; Greasy dirt work;Cleaning. General maintenance. 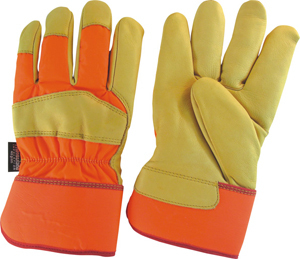 Contact us if you need more details on Work Glove. We are ready to answer your questions on packaging, logistics, certification or any other aspects about Safety Glove、Leather Gloves. If these products fail to match your need, please contact us and we would like to provide relevant information.